Miller is a doctoral candidate in the Department of History at the University of California, Santa Cruz. When the Second Continental Congress and delegates from King Louis XVI signed the Franco-American Alliance of 1778, the French agreed to help the American rebels fight the British and their Loyalist troops for their independence on the North American mainland. In July of 1779, the former governor of the Saint-Domingue, Charles-Henri, Comte d'Estaing, then general and vice-admiral of France's naval forces, sailed to Saint-Domingue to enlist volunteers for a campaign against the British off the coast of Georgia. Among the volunteers recruited, a number of well-known free colored revolutionaries joined the Chausseurs Volontaires (volunteer light infantry), including André Rigaud, Jean-Baptiste Chavannes, Jean-Baptiste Villatte, Jean-Pierre Lambert, and Louis-Jacques Bauvais and twelve-year old Henri Christophe, the future president and king of Haiti's northern region. The 'Siege of Savannah' was not a success for the French Allied infantry, however some historians believe many of the French forces survived primarily because of the heroism and discipline of the free colored volunteers. 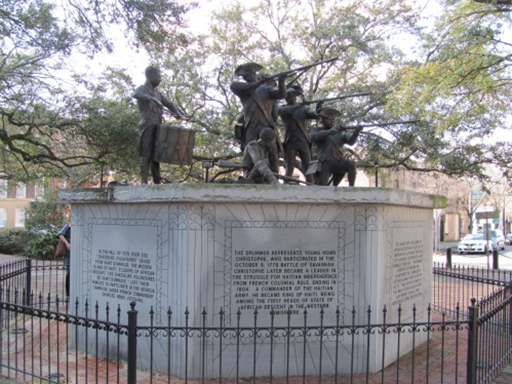 Lacking Haitian documentary sources from the eighteenth and nineteenth-century about the free colored volunteers, historians do not know what specific roles individuals played in the attack on Savannah. According to French military records of the battle, the free colored volunteers are attributed the role of providing the safe retreat of the Allied troops as the rear guard. Back in the colony, despite their status as freemen or as wealthy slave owners, free people of color did not have the same rights as whites of any status. It is probable that returning to Saint Domingue with military experience among white soldiers instilled a stronger awareness of their entitlement to equality and liberty. 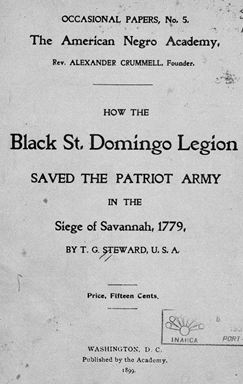 Seeking to dismantle the laws that discriminated against free colored people, the free colored troops who fought in Savannah are believed to have been transformed by the ideals of the American Revolution, setting stage for the thirteen-year war for black equality, freedom and later their independence from France as the new country of Haiti. In 1899, Theophilus G. Steward, an African American army chaplain published one of the first articles about the free colored volunteers in the United States. More than fifty years later, the Haitian historian, Alfred Nemours wrote a comprehensive history of the free colored volunteers in Haiti et la Guerre de l'Indépendance Américaine (Port au Prince, 1952). Both works illustrate the importance of Haitian and African American writers who have worked to highlight the longstanding diplomatic and social connections that have existed between Haiti and the United States.